Sirloin medallions, also called petite sirloins, differ from their full-size counterparts in both thickness -- they measure between 3/4 and 1 inch thick -- and width, at about 3 to 4 inches wide. Taken from the fore end of the top sirloin, closest to the pointed end of the tenderloin, medallions cook quickly in high and dry heat, so they don't have time to toughen. Grilling, pan-frying and dry roasting all work with medallions. Expect a tender bite all the way through as long as you don't cook them past medium doneness. Take the sirloin medallions out of the refrigerator about 15 minutes before you want to cook them and let them sit at room temperature. Heat 2 to 3 tablespoons of cooking fat in a skillet or frying pan on the stove over medium-high heat. Choose from rendered bacon fat, oil or butter, depending on the flavor you prefer. Pat the medallions dry with a paper towel and season them to taste just before cooking. Place the medallions in the heated pan. Sear the medallions for four minutes on each side for medium rare, or an internal temperature of 125 degrees Fahrenheit. Sear the medallions for five minutes on each side for medium, or until they reach 135 F.
Transfer the medallions to a carving board or plate. Rest the medallions for about three minutes before serving. Heat the oven to 425 F. Heat a scant amount of cooking fat in a heavy-bottomed skillet or frying pan on the stove over medium-high heat. Sear the medallions for one to two minutes on each side, or until the bottom edges start to turn golden brown. Transfer the skillet to the oven. Roast the medallions for six minutes for medium rare, or until they reach 125 F. Roast the medallions for eight minutes for medium, or until they reach 135 F.
Take the pan out of the oven and transfer the medallions to a carving board. Let the medallions rest for about three minutes before serving. Marinate the sirloin medallions for one to two hours before grilling, if desired. Set the grill up for medium-high direct heat. If you have a gas grill, turn the burners to medium high. In a charcoal barbecue, layer charcoal in the tray and let it get hot with the lid closed to reach medium-high temperatures. Take the sirloin medallions out of the refrigerator about 15 minutes before you want to grill them and let them sit at room temperature. Insert a skewer through the center of the medallions; you can fit two medallions on a skewer if you space them 1 to 1 1/2 inches apart. Pat the medallions dry with a paper towel and season them to taste if you didn't use a marinade. Lay the medallions on the grill. Grill the medallions for four minutes on each side for medium rare, and five minutes on each side for medium. Take the medallions from the grill and let them rest for three minutes before serving. 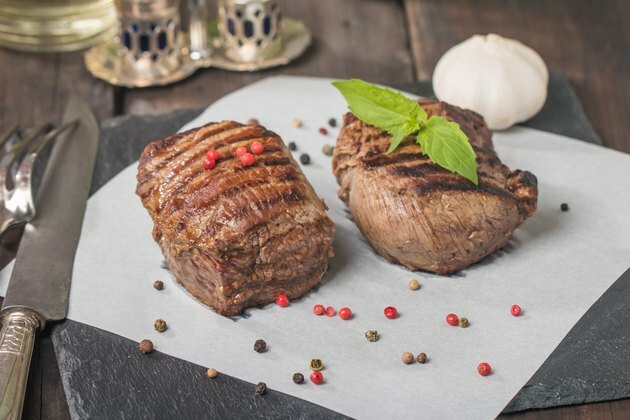 Bard sirloin medallions by wrapping a slice of bacon around them horizontally and securing it with a toothpick, as you might do with filet mignon. The fat renders from the bacon during cooking. Spoon and baste the filet with the fat during cooking. The U.S. Department of Agriculture recommends cooking beef to 145 F, although most people prefer the tenderness of medium rare or medium.